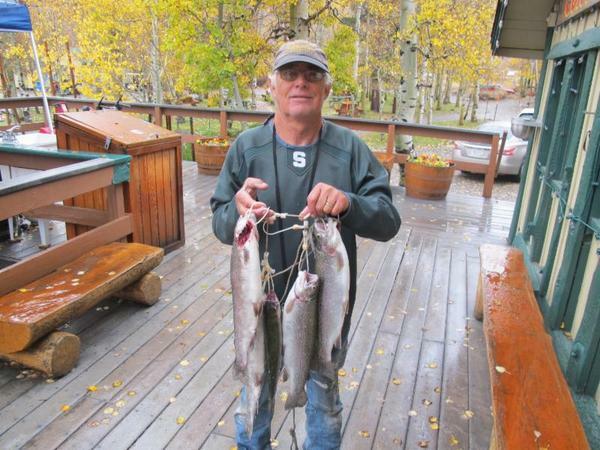 The rainy weather continued this last week and the more it poured the better the fishing got. Seamed a little easier by the inlet and nightcrawlers were the bait of choice. We did not have many reports on the trolling and the fishermen who were did not do as good as the bait or lure fishermen. Don't let bad weather keep you from catching the fish of your dreams. Be prepared, an extra jacket and change of socks can keep you out in the elements longer and just as comfortable as when you are fishing in the sun, a thermos of hot coco doesn't hurt either. Beginning Monday this week the rain is supposed to die down so if you don't feel like braving the wet mountain weather you won't have to (still bring a warm jacket). Catch of the Week: Bill Weed of Torrance, Ca took it to the limit with five very nice rainbows off the north shore using Thomas Boyants! 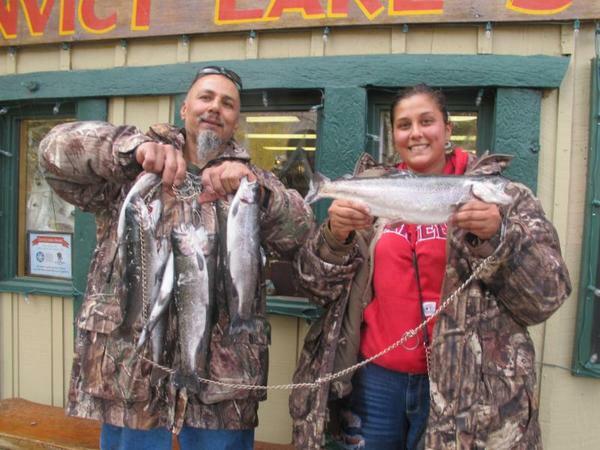 Todd & Lori Walker from Ventura used Berkley Mousetails by the south shore to catch their limit. Kris Kyle out of Compton, Ca tricked this 3lb11oz. bow into biting with a gold and red Thomas Boyant. Nice fish Kris! Tactics/Bait: Several baits did well this week including but not limited to: nightcrawlers, garlic Powerbait and chartreuse Mousetails. Thomas Boyants in gold/red and Kastmasters in larger sizes with bright colors were the dominant lures. Fish seamed to be holding in slightly shallower water and fishing was best around the edges of the lake were the depth changed rapidly. Cast just over the shelves into the deeper water. Sunday it will be wet with just a 10 percent chance of rain on Monday and Tuesday. Wednesday through the end of the week looks dry and sunny. Temps will be in the high 30's and 40's Sunday and Monday warming up into the low 60's by Saturday before it starts to cool off again. Night time lows stay in the 20's and thirties most of the week dipping slightly into the teens on Tuesday night.